Don't wait till the paint on your Ford Mustang gets damaged from sun’s UV rays, bird droppings, tree sap or any other things. 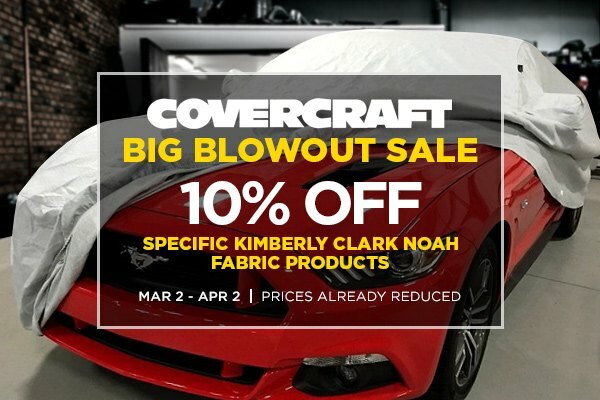 Make sure it is stored safely with Kimberley Clark Noah fabric from Covercraft and save your money with the exclusive offer at CARiD. Buy high-quality Kimberley Clark Noah fabric car covers with 10% OFF the original price. Don’t hesitate and make your purchase right now! Prices are already reduced. This limited time offer is valid through April 2, 2018. Created exclusively by Kimberly-Clark, Noah fabric actually stops water, yet it breathes and allows any trapped moisture, seam seepage or condensation to easily evaporate. High-tech, bonded 4-layer composite fabric uses bi-component side-by-side technology for twin spunbond outer layers, a film barrier, and a soft bi-component spunbond inner layer. Comparing to other car covers, this one is lightweight, easy to fold and store. Find the best car covers solution for your Ford Mustang at CARiD! Quick Reply: Keep your Ford Mustang safe from any abuse with Covercraft Car Cover + Promo!